The Asia Pacific International Filmmaker Festival and Awards (APIFA) hosts its annual festival, commemorating International Humanitarian Day in Kuta, Bali on July 12. 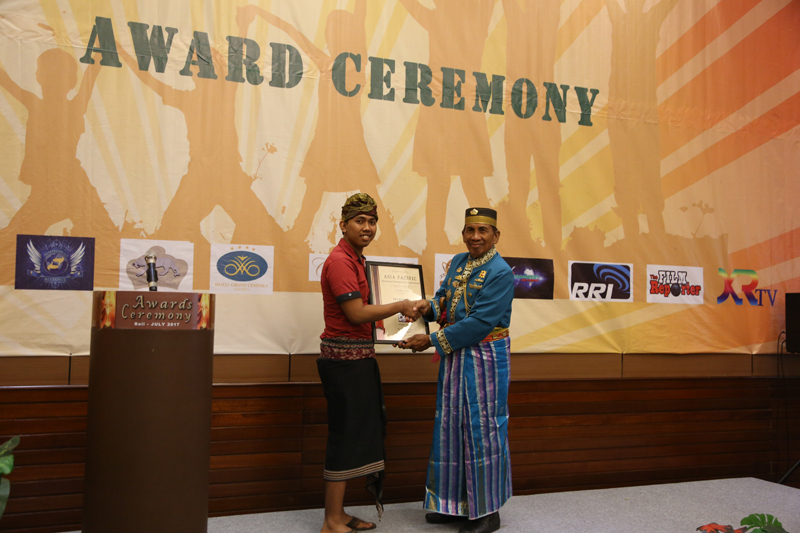 The red carpet Awards Ceremony inaugurated by King Tallo, Haji Andi Abdul Rauf Maro Daeng Marewa (Karaeng Rewa) of Tallo Sultanate, Makassar. Also attending the glorious night were kings and queens of Nusantara: Chairman of Council of Indigenous Culture Kraton Nusantara, Sri Anglung Prabu Punta Djajanagara Cakrabumi Girinata Raja Keraton Amarta Bumi Kendal, Semarang, Sultan Indra A. Disman Sultanate Indrapura South Coast West Sumatra, Ir. Kph. R. Indra Sahdan Commander of the West Coastal War of Indrapura, Ir. Anak Agung Ngurah Putra Darma Nuraga Penglingsir Puri Agung Pemecutan, Badung, Empress Kanjeng Ratu Dinar Retno Djenoli, Queen I. Gusti Ayu Rai, and others. In his opening speech, King Tallo Karaeng Rewa complimented the festival, saying that it has become more impressive and festive. He also stated the intention to make a film about the kingdoms in the Indonesian archipelago. His global vision is that kings of the archipelago could embrace world peace and harmony, through meetings with other kings and queens from various countries in the world. King Kendal Semarang, Sri Anglung Prabu Punta Djajanagara, congratulated the winners of the Festival and said that film festival with humanity theme brings the essential spirit of human values. The Asia Pacific International Filmmaker Festival and Awards (APIFA) was founded five years ago to provide support to independent filmmakers while giving a platform for international filmmakers to spread their excellent films to the Asia Pacific region. In Search of Perfect Consonance (short film) directed by Ruby Yang. Mah e mir (feature film) directed by Anjum Shahzad. Million Loves in Me (director and lead actor) directed by Sampson Yuen. Tatara Samurai (feature film) directed by Yoshinari Nishikôri. Tea Pets (feature film) directed by Gary Wang. On the Awards Night, the jury announced that the overall winners of the festival went to Tatara Samurai directed by Yoshinari Nishikôri, and Two Zions: The Living Legacy of the Queen of Sheba and King Solomon, directed by the American female director, Cheryl Halpern. With its 16th-century setting, Tatara Samurai tells a story of a young man living in the village of Tatara. He must choose between becoming the next Murage (Master Blacksmith), following his father and grandfather footsteps, or a samurai. At that time, Tatara was one of the important steel producers and was often become the target of clans seeking high-quality steel. The film is judged to have high production quality, visually artistic, and bring valuable virtue about the actual meaning of the samurai. "Fools lives for glory. Samurais live for honor." And in himself, he can reveal the true meaning of honor and compassion. Two Zions: The Living Legacy of the Queen of Sheba and King Solomon, tells about the "Two Zions". It focuses on the Zions of Jerusalem, Israel, and Axum, Ethiopia, and smoothly describes the relationship between King Solomon and the Queen of Sheba that has connected two peoples and cultures through their religious observances. These have continued to carry since 950 BC until now. The film is recognized by the juries to give appreciation for the value of humanity and civilization that shaped the modern people. The film is directed expertly, well-edited, informative, and entertaining.